Free tool for easily removing repeating patterns using Photoshop ðŸ˜ƒ. 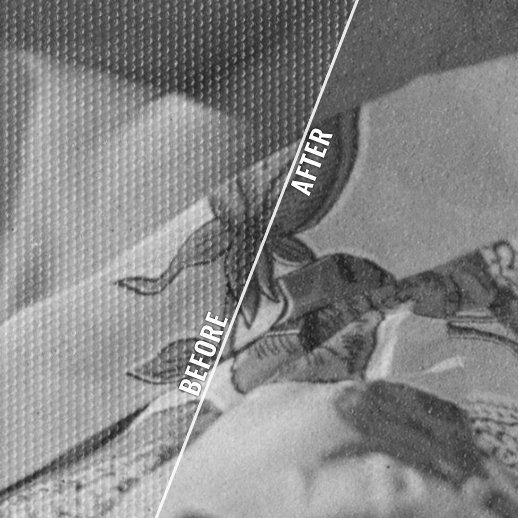 This is a set of free plugins and actions for Adobe Photoshop that will let you easily, and with unparallelled quality, remove regular repeating patterns from images that cannot conveniently be removed by traditional means (for example paper texture and halftone patterns). If you found this useful, or if you run into trouble, feel free to drop a message in the official forum thread. Tested on CS5-CC 2019 and Windows 10, and CC 2017-18 on macOS 10.12-13. Should work on more versions, if you use another version, drop us a comment. Recommended with basic knowledge of how to use the Brush Tool, Layers and the Actions Panel (but step-by-step instructions are included in the tutorial). libfftwx64_3-3.dll â€“ FFTW library. Required by the plugins on Windows. *.8bf/*.plugin â€“ Plugins for doing Fourier transformations (used by the actions). Pattern Suppressor v2.atn â€“ Photoshop Actions for doing pattern suppression. Readme.pdf â€“ Detailed information, and short written tutorial. Copy libfftwx64_3-3.dll to your Photoshop installation folder. Copy the 8bf-files to the Photoshop Plug-ins-folder. Restart Photoshop if it was running. Double-click Pattern Suppressor v2.atn to install the actions. (You can also choose â€œLoad Actionsâ€¦â€� in your Actions Panel Menu). Copy the .plugin-files to the Photoshop Plug-ins-folder. Added Mac-versions of the plugins! (Thanks to Francesco Pierfederici). Place in plugins-folder. No dll needed. (Actions are the same as for the Windows version). From now on we will also start to publish the Pattern Suppressor on the Adobe Exchange (with a bit delay due to Adobe's approval process). Added support for color images! Reworked automatic suppression. It is now a lot more accurate. New naming scheme for plugin-files. Ronc rewrote the plugins and removed the "white red channel"-bug of the old FFT plugins that occured at certain image sizes. Action set by Chain to make pattern removal semi-automatic. Additional processing added to get better results compared to traditional manual process. Plugins compatible with 8/16/32-bit images. Copyright: Plugins made by Ronald Chambers (Ronc) and Francesco Pierfederici. Photoshop Actions made by Jonas M. Rogne (Chain). These tools are free for personal and commercial use. See full details in the Readme.